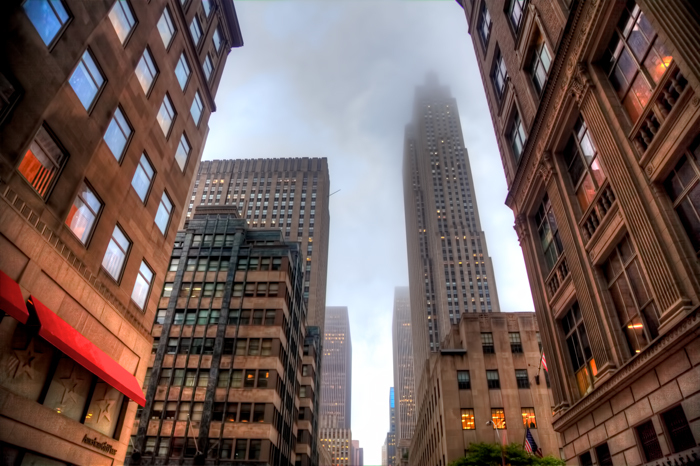 A street view look upwards towards Rockefeller Center in midtown Manhattan. This photo was taken while on a New York City double decker bus tour around the city in May 2011 while I was visiting New York. This photo was taken along E. 49th Street. Check out the rest of my New York photography on my website! NYC with Rockefeller Center by Joey B. Lax-Salinas is licensed under a Creative Commons Attribution-NonCommercial-NoDerivs 3.0 Unported License. Permissions beyond the scope of this license may be available at http://www.joeyblsphotography.com.